RYOBI introduces the 18V ONE+ Power Caulk and Adhesive Gun. This tool features over 500 lbs. of push force to handle higher viscosity material with ease and can apply more than 200 tubes of caulk per charged ONE+ battery. The 18V ONE+ Power Caulk and Adhesive Gun is backed by a 3-Year Warranty and includes an operator's manual. Kit includes (1) P310G Caulk Gun, (1) P189 1.5 Ah battery, and (1) P118 charger. A member of the new DEWALT 12 Volt Max family. This heavy duty inspection camera can stand up to any job. With it's wireless removable screen, the user can get into the tightest of areas. Use your micro SD card to to video and capture your jobsite. Innovation For The Trades. Expand PEX Type-A tubing from 3/8-inch to 1-inch with the 20V MAX* Cordless 1-inch PEX Expander, the fastest PEX Expander on the market. It's proudly made in the USA with global materials. An automatic rotating head helps to ensure even expansion. The bright onboard LED work light and full trigger actuation make it an excellent tool in dimly lit, tight spaces. Carry this tool conveniently around the jobsite with a dual-sided hang hook and belt hook. Rubber overmold on the handle provides an ergonomic grip to keep you comfortable all day. This tool uses DEWALT PEX Heads, and it is compatible with leading competitive PEX heads. The HG8750 was designed to suit your every need with a large array of power outlets and the wattage to back them up. Six standard outlets and a 30 amp 120V and 120/240V locking port make sure that you'll have enough space for all your devices. Power your construction project, recreational vehicle, or your home in an emergency. Push-button electric start (battery included) makes operation easy and reliable. No more drained batteries either, a plug-in charger keeps the battery topped up during long term storage. A large metal fuel tank supplies an impressive 10 hour run time (50% load), while a digital multi-meter tracks run time. The jobsite-tested steel frame comes equipped with equally tough never-flat XL wheels and handles. The ergonomic handle is top mounted for more comfortable transport and less bending and lifting. With over 600 registered service centers across North America and an extended 3-year warranty you can rely on your Hyundai generator for the long haul. The M12 Cordless Special Edition Womens Heated Jacket from Milwaukee Tool provides unmatched warmth and performance for all-day comfort in the cold. The most innovative womens jacket on the market pairs state-of-the-art carbon heating elements with a womens cut, providing a less baggy fit for increased warmth on the jobsite or during outdoor activities. Wind and water resistant, the jacket features 3 adjustable heat settings. The jacket is powered by the M12 REDLITHIUM Battery for up to 6 hours of continuous heat. Designed with Milwaukee durability, the battery delivers fade-free power in extreme jobsite conditions. The battery holder is hidden out of the way in a sleek back pocket that expands to hold an M12 XC battery, or any M18 battery pack. 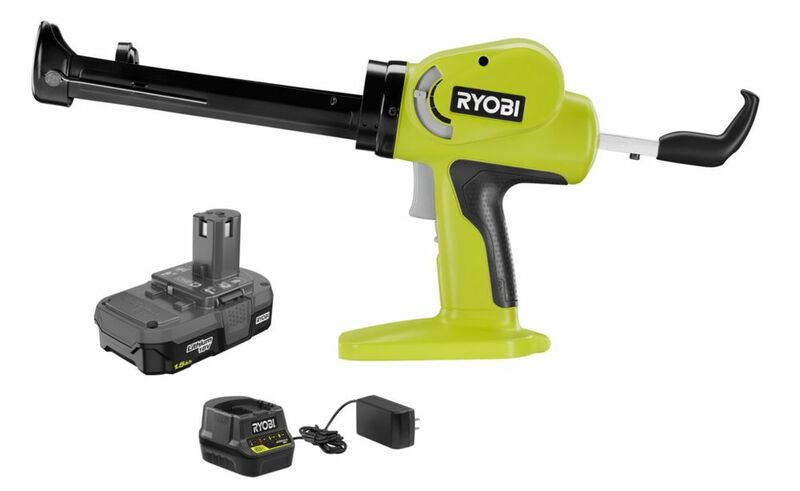 18V ONE+ Caulk Gun Kit with 1.5 Ah Battery and Charger RYOBI introduces the 18V ONE+ Power Caulk and Adhesive Gun. This tool features over 500 lbs. of push force to handle higher viscosity material with ease and can apply more than 200 tubes of caulk per charged ONE+ battery. The 18V ONE+ Power Caulk and Adhesive Gun is backed by a 3-Year Warranty and includes an operator's manual. Kit includes (1) P310G Caulk Gun, (1) P189 1.5 Ah battery, and (1) P118 charger.